Tiffiny from Fight for the Future writes, "New information has surfaced about Facebook's position on S. 754, the Cybersecurity Information Sharing Act (CISA). Sources on the Hill tell us that Facebook lobbyists are welcoming CISA behind closed doors, even though Facebook has been lauded as opposing the bill after CCIA, an industry association they are a member of, came out against it.. CISA would give companies like Facebook legal immunity for violating privacy laws as long as they share information with the government. It's supposed to be for cybersecurity, but in reality companies would be encouraged to share information beyond cyber threat data and the information could be used for prosecuting all kinds of activities." Facebook has come under public fire for its permissive use of user data and pioneering privacy-invasive experiments in the past. They have also supported previous versions of the cybersecurity info-sharing bills, and their chief Senate lobbyist, Myriah Jordan, worked as General Counsel for CISA's sponsor, Senator Richard Burr, immediately before moving to Facebook. Facebook has declined to take a public position on CISA, but in recent days sources have confirmed that in fact Facebook is quietly lobbying the Senate to pass it. Fight for the Future has launched a campaign to demand Facebook take a public position. At a time when CISA is being rejected by the public, security experts, and even the tech industry it's supposed to protect, it was suspicious that Congress is barrelling forward with this bill at breakneck speed. Now, it seems we have part of the answer. Facebook's quiet lobbying is an example of why Facebook will go down as the most hated tech company in history. 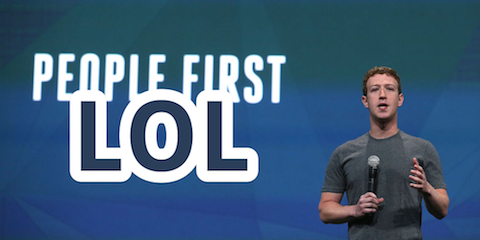 If Facebook wants to reclaim their credibility on user privacy, they need to take a stand against CISA.